This unique bracelet has silicone links and an imprintable flat section for your silkscreened message. This new style of Awareness Bracelets really stands out from the rest! Prices range from $1.59 to $1.09 each. 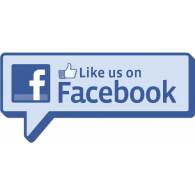 Create your own custom Silicone Awareness Bracelet. Your logo and message are debossed into the silicone bracelet. 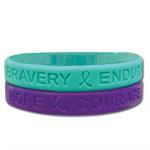 Custom Awareness Bracelets make terrific fundraisers and give-aways for any special event. Prices range from $1.99 to .31 each. Awareness Bracelets: "LOVE SHOULDN'T HURT"
Our Stock Domestic Violence Awareness Bracelet "LOVE SHOULDN'T HURT" makes a terrific fundraiser or give-away for your awareness events. Prices range from $1.49 to .49 each. Create your own Custom Awareness bracelets. Your logo and message are screen printed onto the silicone bracelet. 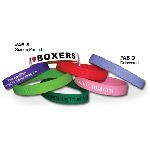 Custom Awareness Bracelets make terrific fundraisers and give-aways for any special event. Prices range from $1.99 to .32 each. Awareness Bracelets: Custom Debossed FAST! Our FAST Silicone Awareness Bracelets are available in stock colors and are debossed in the US for faster production. Prices range from $1.99 to .59 each. Awareness Bracelets: Custom Screen Printed FAST! Our FAST Silicone Awareness Bracelets are available in stock colors and are screen printed in the US for faster production. Prices range from $1.99 to .59 each. 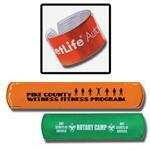 Reflective Slap-Wraps fit comfortably around wrists to help keep people visible to motorists. Prices range from $1.75 to $1.49 depending on how many you buy. Reflective Slap-Wraps fit comfortably around wrists to help keep people visible to motorists. Prices range from $1.49 to $1.25 depending on how many you buy. Reflective Slap-Wrap Combo has a short snap-on wrist reflector, a zipper pull and a pair of lace tags. Prices range from $2.29 to $1.99 depending on how many you buy. Light up your dark bike or motorcycle tires with Tirelites self-sticking tire reflectors. Prices range from $1.69 to 1.19 depending on how many you buy. Plastic SpokeStixs fold over bicycle spokes and adhere to their own backing, creating a unique 2-sided reflector. Prices range from $1.69 to $1.09 depending on how many you buy. All debossed bracelets require a mold charge of $110.00.